Here is a darling collection of soothing necessities to entertain and help any baby drift softly to sleep. Mom and baby will appreciate the two soft receiving blankets and cotton romper outfit when it�s time to get snuggled up for nap time. The new baby will enjoy hugging their little lamb plush while interacting with the cute lamb themed board books. 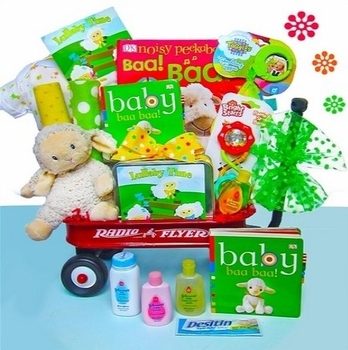 The travel sized Johnson�s baby care products will certainly get some use and soon baby will be pulling their toys and plush toys around in the mini Radio Flyer wagon! This is a wonderfully unique new baby gift for any new boy or girl.